Wintermann 1000 Pro is a large, state-of-the-art, inexpensive machine for spraying, injecting and pouring polyurethane foam, polyurea coatings and polyurea hybrids. Strength, high pressure, massive heating capacity and a hydraulic pump controlling the main pump’s cylinders are the key qualities of the machine which make a difference in those applications where we expect high quality of mixing, foaming and spraying of materials. Wintermann 1000 Pro is an excellent alternative to larger, more expensive and heavier machines, offering superb performance at an attractive price. The system is equipped with lightweight heating hoses, a 300 recirculation system, transformer, and a small handy spray gun. Wintermann 1000 Pro is intended for use by medium-sized and large companies offering the application of two-component materials. Wintermann1000 Pro can be used with selected foams, polyurea coatings and polyurea hybrids which are applied at the 1:1 ratio and require very high temperatures – up to 90 °C! Thanks to its lightweight design and mobility, the system can be used not only at a construction site, but also in industrial plants and specialist car paint shops. Wintermann 1000 Pro is manufactured and intended for use at medium-sized and large companies. It does not require an expensive screw compressor. 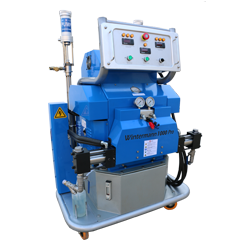 Despite its compact design and attractive price, the machine successfully sprays the majority of commercially available closed and open-cell foams, polyurea coatings and polyurea hybrids. Polyurethane and polyurea spraying system: Wintermann1000 Pro - Polyurethane and polyurea spraying system: Wintermann1000 Pro - Strength, high pressure, massive heating capacity and a hydraulic pump controlling the main pump’s cylinders are the key qualities of the machine which make a difference in those applications where we expect high quality of mixing, foaming and spraying of materials.